Worst day of violence for a year in Iraq Jump to media player Iraq has suffered its worst day of violence for a year, with nearly 120 people killed in suicide attacks targeting the capital Baghdad. 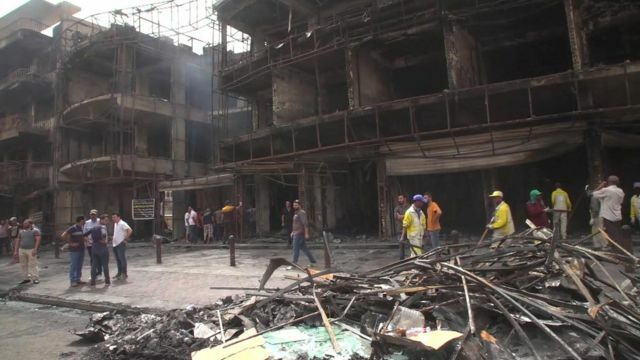 Massive fire following Baghdad blast Jump to media player More than 100 people have been killed and many more injured in an explosion claimed by the Islamic State group in Baghdad, Iraqi police say. Location of deadly Baghdad explosion Jump to media player Location of deadly Baghdad explosion hitting a very busy area. IS bombing kills at least 125 Jump to media player Many more injured in explosion in Baghdad, claimed by IS group. Iraq has suffered its worst day of violence for a year, with nearly 120 people killed in suicide attacks targeting the capital Baghdad. In one, a truck bomb went off in a busy district, badly damaging a shopping centre, which was packed with families at the time. Around 200 people were injured, with so-called Islamic State claiming responsibility.